The leader in trail camera innovation introduces the exclusive Cloak Pro 12 Lightsout trail camera equipped with Batteries and 16GB Sd Card. Ready to scout out of the box, the Cloak Pro 12 is a high performance 12 megapixel unit with both daytime/nighttime video and image capabilities. The easy to use Cloak Pro 12 can take up to a 32gb SD card (16 gb sandisk included) and is powered by 8 AA batteries (included). The Cloak pro 12 features a super quiet shutter and less than a 1 second trigger speed. This stealthy little camera blends into nature with its tree bark texture and will go undetected with its invisible flash. The Cloak Pro 12 comes with easy to use adjustaple bungees. When put through the test the Cloak Pro 12 Lightsout trail camera boasted a 65 ft illumination and detection range. 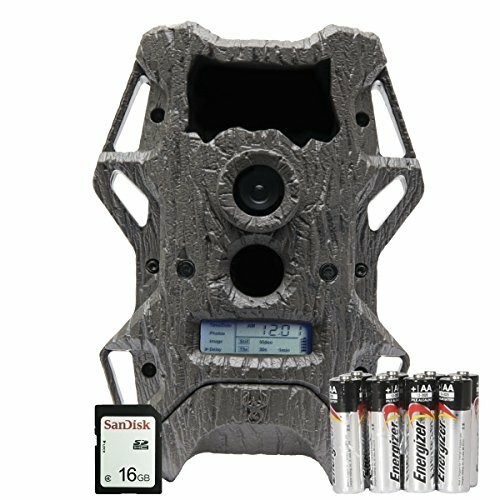 Put this camera out in September and watch it run all season with the same set of batteries. Scout smarter.scout longer with the Cloak Pro 12. If you have any questions about this product by Wild Game Innovations, contact us by completing and submitting the form below. If you are looking for a specif part number, please include it with your message.